Cecilia has studied Tai Chi under Grandmaster Bow Sim Mark since 1979. She has extensive knowledge and experience in many Tai Chi forms including empty hand forms and weapon forms. She has taught both group and private classes for beginners as well as for advanced students. Currently, she is teaching Tai Chi at the BSMTCAA in Boston and the Lexington Chinese School in Belmont. She received the Best Demonstration Prize in the 5th World Grand Wushu Festival, 2000 in Shanghai, China for her Tai Chi Sword. Cecilia is a founder and the president of Base-Two Investment System, a financial software company founded in 1984. 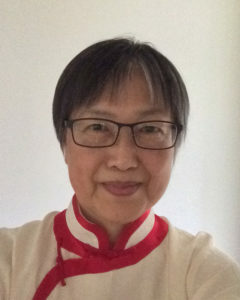 She is also a founder and the president of Cantonese, a non-profit organization focusing on promoting Cantonese culture, in particular, Chinese classical poetry in Cantonese.